Dress up the meeting room with our classy new T-Leg Design. 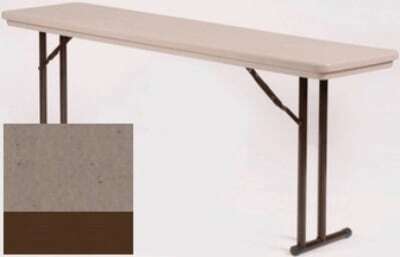 Same waterproof and virtually indestructible top as our standard R-Series seminar & folding tables. This seminar table h as a single 1x2 steel upright and our knife-lock folding mechanism for unobstructed leg room. All T-Leg tables have a 1x2 steel pedestal with nylon glides and fold easily for storage. 29" height, 18" x 72", Mocha granite with black frame.